Bill was a prominent runner and official with VAAA at the turn of the century and was an office bearer with the Melbourne Walking and Touring Club which was formed in 1894 and was disbanded just after the 1914-1918 war finished. He maintained his association with walking once the club reformed as VAWC in 1921 and was awarded life membership in 1933 as a mark of appreciation for his many years of service. 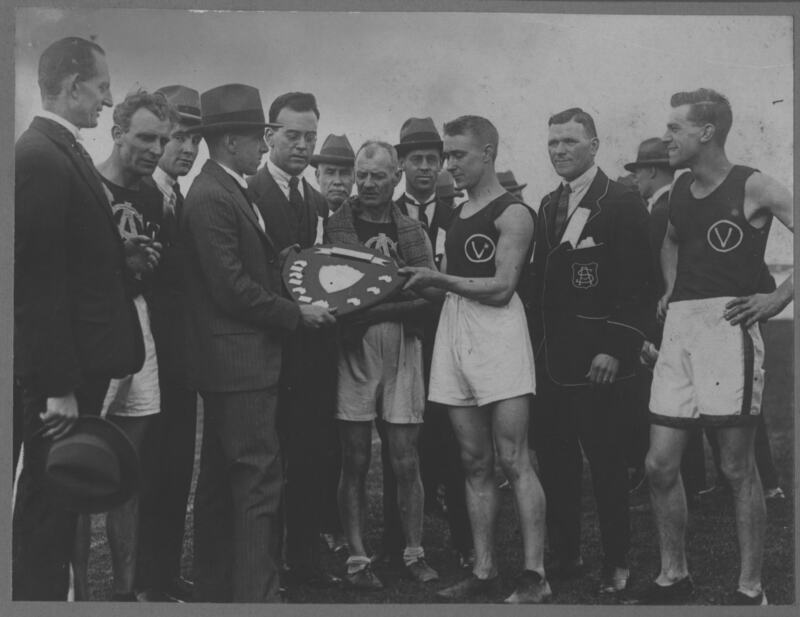 He is shown in the above photo which was taken at the presentations for the 1926 Australian 7 Mile Championship which was held in Melbourne. Bill is sixth from the left, with hat on. From left to right are Ted Drayton (Vic), Snowy McCavanagh (SA), unknown, Bill Dickinson (Sec. VAAA), Rex Merrick (Vic Judge), Bill Billsborrow (VAAA Official), Jim Cole (SA), Frank O’Rourke (Judge), Bert Gardiner (Vic Capt), Harry Fitzgerald (SA Judge), Bob Osborne (Vic). He died during the Second World War period.